James Whiteside and Cassandra Trenary in 'The Tenant'. Photo by Ian Douglas. The Joyce Theater, New York, New York. There’s no questioning that social mores shift over the decades and centuries; what most would have seen as acceptable in one era, most in another time might regard as oppressive, problematic and “backwards”. Given that art often stands as a mirror to the time in which it is made, tensions can arise when art of another time is resurrected. Contemporary audiences might very well recognize those narratives of a time with a different value system. 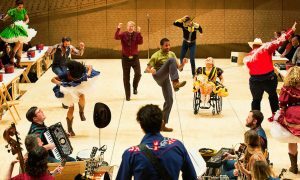 On the other hand, there may very well be ways to restage works of dance and theater in ways that more closely align with the social perspectives of contemporary audience members. Arthur Pita’s The Tenant at The Joyce demonstrated this dynamic. The work was beautifully choreographed and danced, and the supportive technical elements were top-notch. Yet aspects of the theatrical presentation could have been re-framed to have greater sensitivity to a wide variety of audience members. James Whiteside (left) in ‘The Tenant’. Photo by Ian Douglas. The work began with lights coming up on a woman in a white dress, Simone (American Ballet Theatre [ABT]’s Cassandra Trenary). She rose to move on and around her bed, restless, then moved over to a desk at the opposite side of the stage. She appeared to wash down pills with alcohol. Her body at first seemed to be overcome by the sudden flooding of substances, then began to move erratically. Simone spun on her knees, head circling with hair down and moving with her. Her speed and intensity increased, though she found moments of greater restraint as she rose to développé battu and turn à la seconde. A classical music score had the same intensity, though a far brighter mood (original score composed and performed by Frank Moon). Trenary executed this balance of releasing into frenetic movement and regaining technical control with pleasing, impressive skill. She returned to her desk and appeared to inject heroin. Her movement quality then became more helpless and weak, as if trying to support her own body weight. She put on a dress and heels, then walked up to her roof. She then made the jump. The chilling sound of shattering glass filled the theater, realistic enough to truly make its effect. Chilling, slightly atonal music followed. Lights (by Designer Joe Levasseur) in the theater went down, apart from a red light shining from lettering, as if on a billboard. 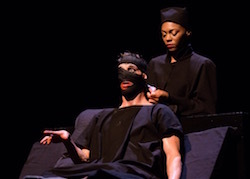 “Was there a trigger warning?” I asked myself, as soon as my body overcame the shock of witnessing suicide (even if a theatrical depiction of it). I was concerned about who in the audience might be legitimately triggered by such witnessing – including those who have attempted suicide, family members and other loved ones of those who have done so or succeeded in the attempt, or those who may be considering it. In today’s world, the group of individuals who fall into one of those categories sadly grows by the day. The lights rose again to reveal Trelkovsky (ABT’s James Whiteside) appearing to tour the same apartment. He dropped his bags down and began to settle in. A slight unease was in the air as he shifted on the bed similarly to how Simone had. Yet all else seemed normal as he dressed for bed and then went to sleep. A calm sound of swooping and a spotlight on him was an effective, aesthetically pleasing way to convey day moving into night. Lights came back up and he arose, dressed, and left – presumably for a day at work. As he was gone, flashing lights and electronica music filled the apartment. He returned to find his apartment astray, random objects here and there – which he appeared to find quite unsettling. The same cycle occurred again with the next night into day into night, this time with Simone herself re-entering. I had to suspend my disbelief, given that I thought she was dead. I realized that I had to put my mind, as a viewer, into a space of magical realism. Trelkovsky became angry at the evidence of an intruder, then came face-to-face with Simone. They danced a pas de deux that was at first contentious and adversarial, then became softer and filled with more understanding. 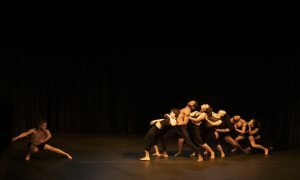 Pita’s choreography, to its credit, featured repeated and altered phrases of relatively simple, yet strong and polished movements (such as battement battu and à la seconde turn, as seen in Simone’s earlier solo). Whiteside offered a graceful strength through it all, along with a theatricality disallowing me from looking away from his presence. Nevertheless, all plot and aesthetic elements combined, Simone appeared to be a threat, a menace, and a villain. In reality, those with mental health and substance abuse troubles are undergoing incredibly difficult experiences for which they did not ask. They are to be supported rather than feared. Portraying Simone, as one who’s experienced such challenges, as villainous only contributes to harmful cultural messages. One may argue, well, that’s just what the source material (a novel by Ronald Topor) describes. That’s a fair point. Yet it could have been possible to portray Simone without substance abuse, and more as vaguely menacing rather than experiencing mental health challenges, in the first part of the show – just as a trigger warning could have been offered in promotional materials for it. Perhaps audience engagement and ticket sales were a concern. A first response to that is that some audience members might be off-put by the lack of a trigger warning. A second response is, though funding is a perpetual concern in the arts, one can surface the question of what are our highest priorities and values? James Whiteside in ‘The Tenant’. Photo by Ian Douglas. Later on, Trelkovsky brought home a love interest – Stella (Kibrea Carmichael). The two danced a sultry, striking pas de deux. In one memorable moment, Stella flipped in the air to land with her ankles crossed and her body wrapped around Trelkovsky. In another, she fell forward into him, one leg in passé. She then backbended and Trelkovsky leaned forwards into her – tango-style. Suspense was in the air with the question of if Simone may enter and ruin Trelkovsky’s chance with this woman. Simone only entered later, when they were sleeping. Trelkovsky became enraged with Simone entering, and Stella left in fear. 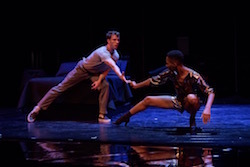 This seemed to be a turning point into Trevolsky’s own madness – as lights rose, he danced movement almost exactly like that of Simone’s solo in the beginning of the show. 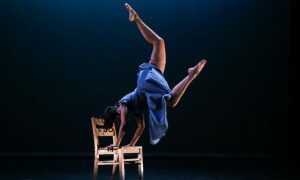 It was pleasing and intriguing to see a different body’s take on this movement – with a bit more strength, a bit less flowing continuity, yet still with a lovely grace. Soon enough Trevolsky also dressed in a yellow dress, yellow heels, an incredibly large and messy wig – along with comically exaggerated makeup. At that level, one might see a reflection of another harmful cultural narrative – women as overly emotional, “mad” to the point of being “hysterical”. Trelkovsky danced the movement of Simone again, before she jumped, and then he himself jumped. Smoke filled the room, and then both Simone and Trevolsky returned to the stage – again coming face-to-face, yet with it now being evident that Trelkovsky had become akin to Simone. This turn of events was incredibly intriguing, and the dancing – as well as technical elements that supported it – were captivating. Yet I couldn’t get out of my thoughts the potential harmfulness of the narratives therein. Artists undoubtedly have a responsibility to hone their crafts and push their art forms forward. Yet they also have a responsibility towards social ethics and how their work may impact audiences. Both aspects are part of helping to illuminate the world around them, of art being a clarifying mirror to life.